All website designs created by ADKC Web Design are designed in conjunction with the site owner, and a style is developed that reflects the nature of the business. 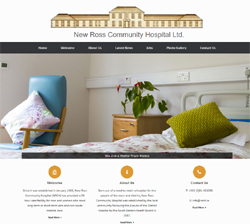 New Ross Community Hospital (or NRCH) is a nursing / care facility in New Ross for elderly men and women who need long- or short-term care, respite care or convalescent care. This CMS website is fast and responsive, and can be easily updated by the NRCH administrators. 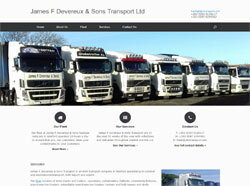 James F. Devereux & Sons Transport is an Irish transport company, based in Wexford, who specialise in national and international transport, both import and export. This is a Content Management System (CMS) website that the owners can easily update. The Land of Creedon is the first in the Centurium series of fantasy fiction books written Co. Wexford author Denis Thompson. From screaming birds and monsters made of rock to trees a million feet tall and an accompanying soundtrack, this is a gem for all lovers of fantasy fiction! This Content Mangement Website can be easily updated or edited by the site’s owner. RBTR8 is an arbitration business based in Wexford and owned by Christopher Doyle of CVS Doyle Agencies. RBTR8 provides mechanical, construction and power generation arbitration services. This Content Mangement Website can be easily updated or edited by the site’s owners. P.E. 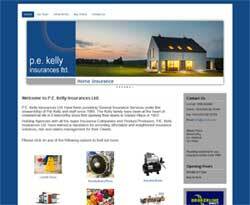 Kelly Insurances Ltd is an insurance broker based in Enniscorthy, Co. Wexford. They offer all types of insurance, including car, home, fleet, commercial, office, travel, and many more. Why Mediation? 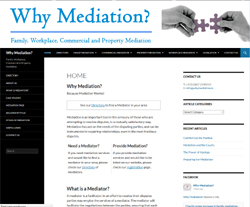 is a directory of mediators in Ireland. Mediation is important in helping to resolve disputes in a mutually satisfactory way. Mediation focuses on the needs of the disputing parties, and can be instrumental in repairing relationships, even in the most fractious disputes. The site owner can easily edit the site content, and add new mediators as needed. 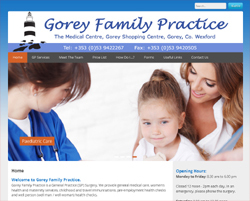 Gorey Family Practice is a General Practice (GP) Surgery, providing general medical care, women’s health & maternity services, childhood & travel immunisations, pre-employment health checks and well person (well man / well woman) health checks. This content management system is easily updated by the site admins via a secure login. Dot To Tot runs group antenatal classes in Enniscorthy, Co. Wexford, and Tullow, Co. Carlow, and also runs private antenatal classes in counties Wexford, Carlow, Kilkenny, Waterford and Wicklow. The antenatal classes cover such topics as signs of labour, labour pain relief options, delivery options and starting breastfeeding. Smidirini Mosaics allows people to discover and express their creative side. The website showcases the mosaics and mosaic kits from Smidirini Mosaics, where you can buy mosaic kits online. There are video instructions on the site on how to create and grout beautiful pieces of mosaic art. With in-studio courses run by the enthusiastic, helpful and friendly tutor, Maedhbh, anyone can make beautiful mosaics. As a content management system, the site administrators can easily log in and update the site, adding photo galleries, products to the shop, mosaic video tutorials, blog posts, and much more. 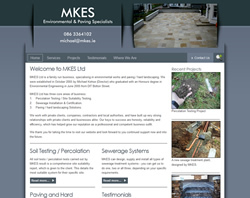 MKES Ltd is a family run business, specialising in environmental works and paving / hard landscaping. They were established in October 2005 by Michael Kehoe (Director) who graduated with an Honours degree in Environmental Engineering in June 2005 from DIT Bolton Street. This CMS website can be easily updated by the site owners. McGannon’s Forklifts is a family operated business supplying a wide range of new and used forklifts. They can also meet your forklift hire needs, as well a supplying forklift spare parts and forklift tyres. All the forklifts available from McGannon Forklifts are shown on this site, which the owners can easily update as needed. 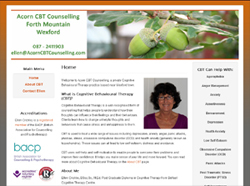 Acorn CBT Counselling, a private Cognitive Behavioural Therapy practice, is based near Wexford town. Cognitive Behavioural Therapy is a well-recognised form of counselling that helps people to understand how their thoughts can influence their feelings and their behaviours. 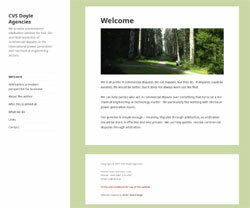 This is a Content Management System website that can be quickly and easily updated by the website owner. 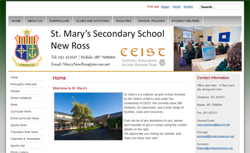 St. Mary’s Secondary school in New Ross is a Catholic all-girls school founded by the Sisters of Mercy and under the trusteeship of CEIST. There are approximately 600 students in the school, 20 classrooms, and a wide range of facilities, clubs and resources. The St. Mary’s website is a Content Management System (CMS) website, allowing the administrators to update the site quickly and easily. Lalor Auto Electrics in Ardcavan, Wexford, are specialists in repairing and rebuilding all makes of starters and alternators. They also specialise in fixing all kind of car electrics / car wiring problems, for example if your car won’t start, lights, wipers, electric windows or radio not working, battery flat or battery light on. They offer a free alternator charging test, so that problems can be diagnosed before they impact on you, and have a mobile service so that if you run into problems at the side of the road they can come to you and get you going again. Their website, which incorporates a plugin to show their latest Facebook activity, is very easy to update. 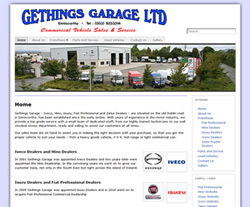 Gethings Garage are dealers for Iveco, Hino, Isuzu and Fiat Professional. They are situated on the old Dublin road in Enniscorthy, and were established in the early sixties. Gethings Garage sell, service and repair vehicles. Their parts department offers you a wide range of genuine parts and accessories designed specifically for your vehicle, and their sales team are always on hand to provide you with the best vehicle to suit your needs – whether that is a heavy goods vehicle, 4 X 4, mid-range or light commercial van. Their website can be qiuckly and easily updated by the administrators. 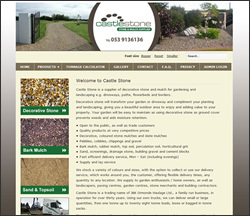 Castle Stone is a Wexford-based supplier of decorative stone, bark mulch, sand and topsoil for gardening and landscaping. Castle Stone stock a variety of colours and sizes, with the option to collect or use their delivery service, delivering any quantity to any location. They supply to garden enthusiasts / home owners, as well as landscapers, paving centres, garden centres, stone merchants and building contractors. The administrators at Castle Stone can easily update their CMS website to add new information and photos. Hearne Line Marking specialises in all types of line marking, from road marking and car park marking to sports facilities and playgrounds. They are based in Co. Wexford, but provide line markings and road markings in all areas of Ireland. As well as providing a complete range of road marking, they also do road studs (cats’ eyes), both permanent and temporary. 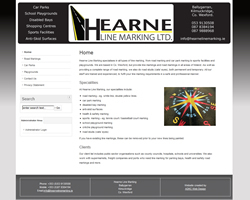 The Hearne Line Marking CMS website is quick and easy to update by the administrators – the personnel in Hearne Line Marking. Our Lady’s Island is a place of pilgrimage in the South East corner of Ireland. This website allows visitors to read about the annual pilgrimages and daily masses that take place there, the history of the island, a calendar of events, and photo galleries of past events. This is a Content Management System (CMS) website, so the administrators on Our Lady’s Island can log in and update the website as they wish. Florist Grace Murphy provides flowers for all occasions, from wedding bouquets and flowergirl posies to debs corsages, a dozen red roses on Valentine’s Day and funeral wreaths. Grace meets clients at a time that suits them – daytime, evenings or weekends – has free parking, and can accept credit / debit cards. 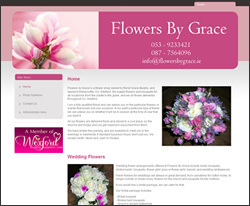 This is a Content Management System website, which authorised users at Flowers By Grace can log in to and update easily. Tuckmill Transport, based in Enniscorthy, Co. Wexford, is a courier and haulage company specialising in next day nationwide delivery to all parts of Ireland. They are in business since 1995, operate out of a 12,000 sq ft warehouse, and became ISO accredited in 2009. 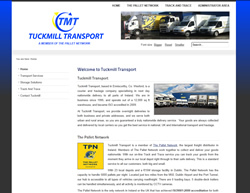 Tuckmill Transport is a member of The Pallet Network, the largest freight distributor in Ireland. Members of The Pallet Network work together to collect and deliver goods nationwide. This is a Content Management System website, so authorised Tuckmill Transport users can log in and easily update the content on the site. Advanced Door Systems provide high quality garage doors, industrial doors, security shutters and secure pedestrian access doors. Their products include steel security roller shutters, PVC roller doors, PVC insulated sectional doors, pedestrian access doors and sliding doors (eg. for farm buildings). 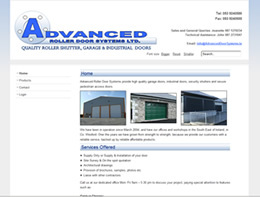 This is a Content Management System website, which Advanced Door Systems can log in to and update easily. Mag Dunphy is a fully qualified and experienced ADI (Approved Driving Instructor), and provides driving lessons in Gorey, Wexford, Enniscorthy and New Ross. 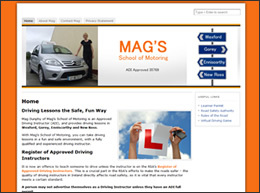 Mag works with complete beginners as well as those preparing for their driving test. This is a Content Management System website, which Mag can log in to and update easily. Andrew Askew is an experienced and fully qualified Counsellor and Psychotherapist in Wexford. Andrew’s psychotherapy and counselling offers a secure and confidential setting in which people can explore the issues that prevent them from leading a fulfilling life. 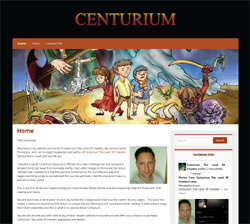 This is a Content Management System (CMS) website which Andrew can now log in to and update as he wishes. Victor Copeland is a CPA accountant in Enniscorthy, Co. Wexford. This website allows visitors to read about the services provided by Victor Copeland, and to contact the business by phone, email or an online form. This is a Content Management System (CMS) website, so the administrators of Victor Copeland CPA can log in and update the website as they wish. Expert Cabling is a network cabling company based in Wexford, under the management of Clifford Gainford. The Expert Cabling website lists the wide range of cabling services being offered, provides background information about the company and Clifford, and lists all the relevant contact details. Holistic Touch Therapies is based in Co. Wexford and provides complementary therapies such as reflexology, Indian head massage, reiki and chakra balancing. This website describes the available treatments and their benefits, as well as giving information about rates, duration of each treatment, special promotions, client reviews, and all the contact details for the therapist. Ardmore Holiday Homes is a busy self-catering development in the seaside village of Ardmore, Co. Waterford. This website allows users to see the accommodation and nearby attractions, to find out information such as accommodation rates, restaurants in the area, and to make a booking enquiry.